Rain Poncho is rated 4.7 out of 5 by 3. Rated 5 out of 5 by Adam from Best investment for weather. I'm now on my second one of these, after unfortunately losing the first one while on documentary shoot in the jungles of India. 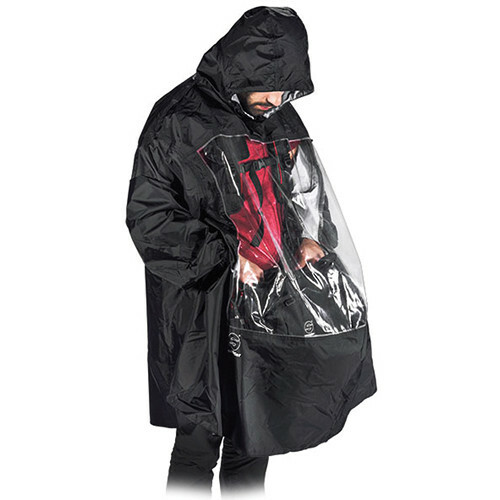 This poncho is easily one of the best investments you'll ever make for your kit. It allows you to see and access your entire bag, while keeping you and your gear dry as a bone. I've mixed and boomed in the poncho everywhere, in every kind of downpour, from cold windy city streets, to tropical rain forests, to the walkways below Niagara Falls. It's never failed. You do, however, have to get used to the rest of the crew referring to you as Darth Vader, or Guy From Unbreakable. But hey, they're wet; I'm dry. Pretty sure I get the last laugh every time. Rated 5 out of 5 by Dmitriy Nazarov from Everything is fine! Came what you need and fast! Thank you! Bought for work, which will begin in September. I think everything will be fine! Poncho will save from the rain!Sorry for my translation! Rated 4 out of 5 by Alex from Roomy. Good poncho. It's roomy and easy to pull over the top. Compacts down nicely as well. It's a rare event for me to have to work in a rainy environment but this will come in handy when I do. weight of the sachtler rain poncho sn606? The weight of the poncho is approximately one pound. Is this one size fits all? No women's size? I'm petite and will be overwhelmed with the poncho down to my ankles! how ist the weight of the rain poncho sachtler sn606? For me, it is great. Heavy enough not to let rain seep through, but light enough for easy run n gun.